I came from a Christian home, but started to question my faith when I began living a lesbian lifestyle. I was dealing with several other issues including sexual promiscuity, and chemical dependency. I was overwhelmed with all of my sins, and I thought God was angry with me because of what I had done. Many people told me that God could not answer my prayers because of my sinful lifestyle. I didn’t think I would ever be forgiven, and I lost all faith in God. I hit rock bottom and had nowhere to turn. I wanted to make a radical decision to change my ways, so I applied to Mercy Ministries. I came to Mercy as an angry, controlling, depressed person. While at Mercy, God has turned my mourning into dancing. Now I realize that I don’t need drugs or alcohol to feel enjoyment - instead my joy comes from within, and I wake up every morning with a new zeal for Christ. In the past, I felt the need to please people in order to get their approval, but now I realize that true friendships are based on Christ. Now my self-image reflects Christ because I know I have been made wonderfully in Him. My trust and hope has been restored and I have a true desire to live in freedom. After Mercy, I am going to attend a university in Odessa, TX and get a part-time job at Campfire for Kids. I look forward to getting involved at my local church, and I can’t wait to live out the plans God has for my life. Freedom is amazing and I am ready to walk it out! From a very early age, I lived a hazardous lifestyle that involved anger, depression, drug use, and eating disorders. I can remember many abusive relationships with both men and women. I was even involved with a gang member. During this time, I suffered mental, sexual, physical and emotional abuse. I began selling drugs and stripping, which landed me in jail. At one point, I was in a relationship with a girl that tried to help me get clean. She eventually committed suicide while I was on the phone with her. When she died, I felt I had nothing to live for. I returned to my old lifestyle of drugs, alcohol, stripping, money, and men. I ended up in jail four more times and even found myself in a relationship with a man that tried to kill me. I began another a long term relationship with a man that proved to be just as destructive as the others. When I tried to leave him, he threatened to commit suicide. I was so fearful that I would lose someone else to suicide that I decided to take my own life instead. I took every prescription pill I could find. I was tired of my lifestyle, the drugs, the stripping, everything—I was done. I woke up five days later with a tube down my throat helping me breath. I learned that I was declared legally dead two times while in the hospital. I had hit rock bottom and I needed God. I was broken. After my recovery, I realized I needed help. I found Mercy Ministries on the internet and decided to apply. During my time at Mercy, God has shown me that I am His child, and He has made me exactly who He wants me to be. I have God the Father as my protector so I am capable of speaking my mind and I no longer fear what others will think. I know that he has removed all of my sins as far as the east is from the west. After graduation, I am so excited to go home and work on a horse ranch. I will also be very involved with my church. Mercy Ministries is an amazing program for girls who actually want to seek the Lord and live life in complete and total freedom. I want other girls to know that although you may think you cannot be free, with God all things are possible! 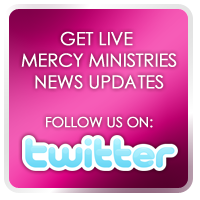 I came to Mercy Ministries battling depression, suicidal tendencies, and drug addiction. I was very confused about who I was and what a real relationship with my Savior looked like. I spent so much time believing Satan’s lies because I had never been shown the truth before. I lost my home, my job, and worst of all my children. I learned of Mercy Ministries through a friend that had graduated from the Monroe home. During my time at Mercy, God has been so faithful to answer me as I cried out to him. He was always there even when I felt so alone and believed that I couldn’t handle another second. He has revealed himself to me in the most intimate and simplest of ways—through worship, prayer times, through His Word, and through the staff. As I draw close to Him, he continues to give me new revelations of how much He loves me. When I return home, I am going to get a job and complete my education. But most importantly, I am looking forward to being the mother God has made me to be, and restoring relationships with my children and family. I want other girls to know that if you are struggling with issues and feel hopeless, don’t wait and put off getting help. I found freedom through God at Mercy Ministries. I began struggling with an eating disorder when I was 13 years old. At first, I simply wanted to loose weight, but I quickly lost control. I was first hospitalized when I was 16. Eventually I was sent to a longer care program in Vancouver, Canada. Two years after my last hospitalization, I knew I still needed help, and I didn’t know where to turn. I found the Mercy Ministries web site while I was searching for a Christian eating disorder program. With the support of my boyfriend and my family, I applied to Mercy Ministries. While at Mercy, God has shown me over and over again that His love for me is unconditional and unfailing. I no longer live in constant fear and sadness. I know I am God’s daughter, and I am fearfully and wonderfully made. Everyday is another chance to surrender my plans to God and let Him take control. Mercy brought me to a place where I can see that God loves me and has a plan for my life. I never thought that I could feel as free as I do now. After graduation I will return to my hometown and move out of my parent’s home. I am looking forward to getting involved with my church and returning to school. I want to get married and begin a family of my own. I struggled with bulimia and an addiction for years. It almost cost me my life. I didn’t know my value or worth and was stuck in a pit. One of my friends heard Nancy Alcorn speak, and she told me about Mercy Ministries. She asked me to consider going. and I decided to give it a try. While at Mercy, God has shown me that I don’t have to perform and wear masks for Him to care for me. No matter what I do, He will love me. The staff encouraged me live a life of victory, and God saved my life though Mercy Ministries. After Mercy, I plan on going home to work for awhile. Eventually, I would like to go back to college. Growing up, I dealt with a lot of abandonment issues as well as physical and mental abuse. Because of this, I fell into an eating disorder and chemical dependency. I was unable to deal with my emotions, and would often binge to cover up what I felt. There were patterns of unhealthy relationships in my life because I never had the right example. I found myself unable to make any healthy decisions and because of this, I ended up homeless and broken-hearted. I felt like my life had no purpose. I had many suicidal thoughts and began to self-harm. I was desperate for help. That’s when I decided to apply to Mercy Ministries. While I was at Mercy, I learned about the love that God has for me. He has shown me what true love is. I now have boundaries, confidence and standards. I know what the enemy meant for harm, God is going to turn around for good in my life. I know that He is with me wherever I go, and that I was created for something amazing. I will never allow myself to be treated as lower than dirt again because I know I have value in Christ. After Mercy, I plan on going to school to get my degree in psychology. I would love to eventually become a counselor so I can help other people achieve freedom. I want other girls to know that God is a life-changer. If you are struggling he will transform life just like he did mine at Mercy Ministries. Victory for Five More Girls! 2nd Annual Run for Mercy! Mercy Volunteer Invited to the White House! Event Filled Weekend in St. Louis! A Double Blessing – Straight from the Heart! !